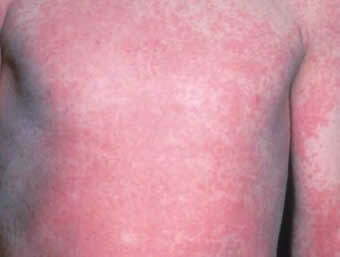 Scarlet Fever produces a rash, which consists of very small red bumps that begin on the neck and groin and then spreads to the rest of the body. 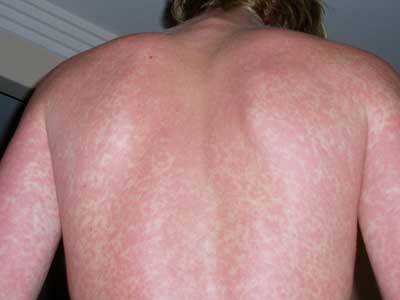 The rash has the characteristic feel of sandpaper and typically lasts five to six days. The rash blanches on pressure. The rash is sometimes worse on the neck, elbow creases, arm pits (axilla) and groin and once the rash fades, the skin may peel. 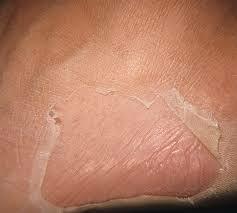 This peeling may last up to six weeks. 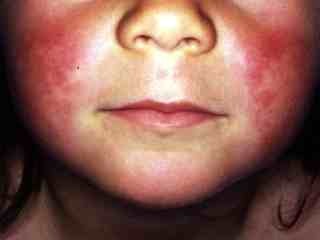 The sandpapery rash does not usually occur on the face, the patient's forehead and cheeks appears red and flushed. In addition to this flushed appearance, there is usually a pale area around their mouth (circumoral pallor). 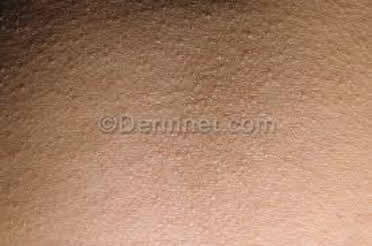 Another finding is dark, hyperpigmented areas on the skin, especially in skin creases. These areas are called Pastia's lines or Pastia's sign. The patient may also have a fever and sore throat. During the first days of infection, the tongue is coated heavily with a white membrane through which swollen, red papillae protrude (classic appearance of white strawberry tongue). By day 4 or 5, the white membrane sloughs off, revealing a shiny red tongue with swollen papillae (red strawberry tongue). © 1996-2013 Neal Chamberlain. All rights reserved. Neal Chamberlain, PhD. A. T. Still University of Health Sciences/Kirksville College of Osteopathic Medicine. Take Care and Think Microbiologically!